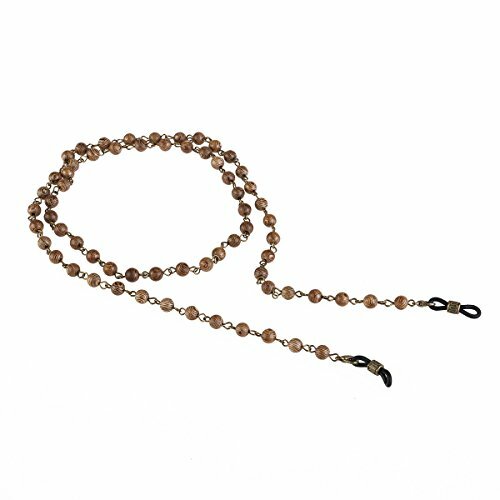 The item is a delicate and gorgeous wood bead eyeglass chain neck strap holder, and features adjustable rubber ends with stainless steel coils to make your eyeglasses not easy to fall off. The eyeglass cord is a great choice as a gift to friends. - Total length: about 85cm/ 33.5 inch. Cord width: 6mm/ 0.24 inch. - 100% brand new and high quality Eyeglass Sunglasses Chain Cord Neck Strap Holder. - Delicate snake chain style eyeglass chain, simple and fashion. - Adjustable silver rubber ends with stainless steel coils. - It is a great jewelry, both sides of the high elastic silicone rubber tip firmly entangle the temple, not easy to fall off. - Also act as a great decoration for yourself or your friends. - Note: the eyeglasses in the pictures are not included. Material: Wood. Total length: about 85cm/ 33.5 inch. Cord width: 6mm/ 0.24 inch. It is a great jewelry, both sides of the high elastic silicone rubber tip firmly entangle the temple, not easy to fall off. Also act as a great decoration for yourself or your friends. Delicate snake chain style eyeglass chain, simple and fashion. If you have any questions about this product by LUOEM, contact us by completing and submitting the form below. If you are looking for a specif part number, please include it with your message.